Email marketing is one of the most powerful means of communication between a brand and consumers. It proves instrumental in creating a dialogue between the two when it comes to conveying information, offers, news, and product information. It’s not only a easy and proven marketing strategies to reach out to masses, but the most cost-effective too. It yields great results when carried out using any of the leading email marketing tools. Emails add a personal touch to your communications with the subscribers. Hence, marketing specialists always prioritize email marketing campaigns when devising the marketing strategy. What Is An Email Marketing Tool? An email marketing tool is an application that helps marketers and business owners to create, send, optimize, track, test, and report their email marketing campaigns. There are a plethora of email marketing tools available today which fulfill some specific needs and act as a subject line generator or email signature creator. On the other hand, you can also choose a tool which offers all these functions together, and you don’t have to worry about creating a catchy subject line, designing a great email signature, and so on. Why To Use Email Marketing Tools? Despite email marketing being a proven marketing strategies, why do you need an email marketing tool? One of the primary reasons for using an email marketing application is the automation of the entire process. If you are a marketing professional or even a business owner, you would have a lot on your plate, making it difficult for you to create and send emails for every campaign. Not to mention the hassle it could be to respond, monitor and analyze these bulk emails. The email marketing tool comes to your rescue. You can perform all the functions of an email signature generator, subject line creator, email optimization, and much more at one single platform; saving time and energy. Looking for an email marketing tool? What Features Should You Look For In An Email Marketing Tool? Email marketing is definitely one of the most beneficial marketing strategies, but not all marketing campaigns are successful. There are a number of emails which never see the light of day and end up getting lost in the swarm of personal and official mails of a customer. Using a free email marketing tool might seem a lucrative option, but it can actually have certain shortcomings which can result in your email campaign giving no or low results. While most marketing platforms offer similar services, some core features differentiate between them. Figuring out if you are comfortable with the tool’s setup or user interface (UI) is quite easy. Most of the email marketing software offers a free trial which makes it possible for business owners and marketing specialists to give them a try. Almost all the tools available today have clean and uncluttered layouts designed with easy navigation in mind. Consider the tool which you find easy to work with. The email marketing tools available today include almost everything that you may think of. You can choose a plan for as low as $5 per month. In case you do not wish to choose a bulk or monthly plan, some tools offer pay-as-you-go packages as well. List out what services you are looking for in the tool and how much you would be shell out for it. Adding each subscriber manually from your comprehensive mailing list or even building a contact list can be a daunting and time-consuming process. Many email marketing tools allow you to copy and paste the list in one go or upload a CSV or an Excel File. Some tools even let you integrate third-party software such as CRM, Salesforce etc. This can prove highly beneficial in the long run as you won’t have to import new contacts each time. One of the most major steps for email marketing is creating or designing the newsletter. Look for the kind of templates a tool offers, can you import your own HTML? If you design a newsletter in the tool from scratch, how easy is it to add graphic designs? Consider these when you are using the trial for a tool and base your decision on the level of ease for creating campaigns. Email marketing has reached new heights today as many tools offer auto email responses based on certain actions or events for a subscriber. For instance, shooting a welcome mail for a new subscriber, wishing them on their birthdays and anniversaries and so on. Such emails strong personal touch in your marketing campaign, making it easier to build a powerful brand identity. Running a marketing campaign or shooting thousands of emails can be all vain if you cannot track its progress and impact on the audience. Check out what kind of tracking is offered by the tool, which parameters are measured and how much customization is provisioned in generating reports. You can only learn so much about a tool while running a business. There would be times where you will find yourself stumped or looking for answers in case of doubts regarding the tool. Choose an email marketing tool which offers comprehensive support either through 24/7 phone support, live chat, documentation, video tutorials, FAQs or a combination of these. All small businesses are restricted with a lean budget and look to cut corners in all areas from hiring a logo designer to using the most affordable or even free tools. Choosing the right email marketing tool for your business can set the tone for returns on your campaign. As a growing business, it is imperative to make sure that each amount spent brings home some benefits. 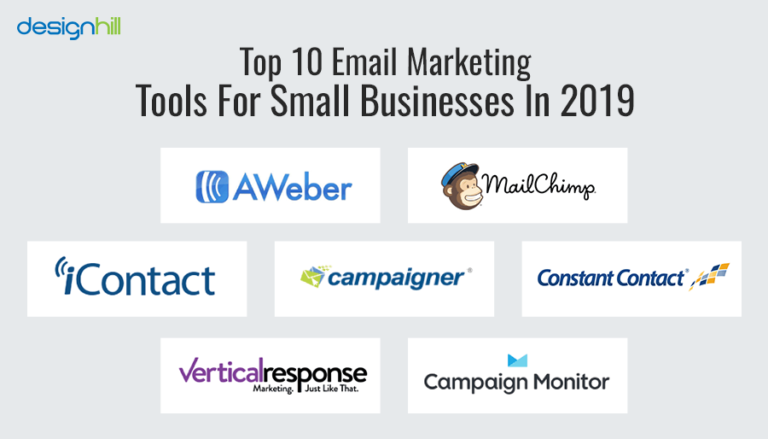 Here are the top 10 email marketing tools which have proven themselves to be effective and can bring handsome returns for your business in 2019. MailChimp is one of the most popular email marketing tools used around the world. Founded in 2001, it is a brand which has been in the industry longest and is known to all. MailChimp offers both free and paid versions of the tool. For small businesses that are starting to build their mailing list, MailChimp provides a web-based option which can substantially eliminate the initial investment. In the free version, you get access to all the standard features of the tool. It allows you to build your mailing list to up to 2000 and you can send 12,000 emails in a month. The paid version offers some advanced features such as sign-up forms along with sending and tracking ability. You can import your contacts from your existing mailing list and can even preview the mail to check how it would appear in the inbox. ConvertKit is yet another affordable, if not comprehensive, email marketing tool designed for authors, bloggers, and podcasters. It is ideal for businesses which are still growing their mailing list. The tool offers opt-in forms which can be customized to meet your requirements. You can also use their email automation feature or create drip campaigns for an extensive or controlled email campaign respectively. There are 4 packages which can be purchased either with monthly or annual billing. When you choose the monthly plan for 1000 subscribers it would cost around $29 when billed monthly and $24 when billed annually. There largest package for 8000 subscribers costs approx. $99 monthly and $83 as part of the yearly plan. All packages have the same features apart from the subscriber cut-off limit and offer a 14 days trial. One of the biggest competitors to MailChimp, AWeber offers some great pricing plans. Their basic email marketing plan starts at $19 for up to 500 subscribers and no limit on emails. The tool also offers quarterly or yearly billing options to its users. The tool offers some attractive features such as mobile responsive emails. This is great since today almost all emails are accessed via smartphones. You get access to some great newsletter templates so that you can either use them as is or you can use your own layouts designed by your in-house graphic designer. The tool has email automation as well as Integrated email sign-up form feature. Another great benefit of the AWeber email marketing tool is that you can tag your emails so that they are sent based on subscriber behavior and you can also easily track and report the campaign performance. AWeber also offers access to its stock library of over 6000 images to its customers which are a huge bonus for any small business on a budget. Infusion is one of the oldest and most renowned email marketing services. The tool has been designed keeping in mind automated funnels and landing pages. Using infusion soft, you can set up trigger emails for all possible and imaginable circumstances. You can also use the funnel system wherein you can set triggers based on already known triggers. For instance, your subscriber has clicked on offer and added the items to their cart, but not completed the purchase. You can set a trigger which then mails such customers prompting them to finalize the purchase to benefit from the offer. While it is one of the most sophisticated and powerful tools available for email marketing today, its complex system makes it a hard sell. A Ukraine-based marketing automation company, eSputnik has created an email marketing tool with their IT experience and e-marketing skills. The tool has a customer oriented and understandable interface. Being a multichannel marketing tool, it is one of the best-automated marketing tools for a small business. You can create and send emails, text messages and web-push using this tool. Using its email editor, business owners can create scenarios defining the time or situation, recipient and where to send certain messages. One of the biggest benefits of choosing this tool is that their free plan is also loaded with features which can be used by beginners as well as advanced users. Pardot is a great email software solution for small-to-medium sized businesses. The tool has proven to be highly successful for B2B marketing with its state-of-the-art CRM features. The prices start from $1000 per month and go to a whopping $3000 a month. These packages have been priced on a higher side considering the premium features it has to offer. It provides unbeatable ROI tracking and analytics. You can also customize and manage the campaigns from within the marketing suite itself. The lead deck or dashboard provides with real-time activity updates. One of the key features of this tool is easy integration with Salesforce. Hence being a small business, it makes sense to invest in this otherwise great tool is if you are already using Salesforce as well. GetResponse is one of the most affordable and feature-rich tools for email marketing. Its array of benefits includes email automation and CRM. You can use the drag and drop email tool to create some beautiful newsletters. Analyzing and modifying the campaign is easier with the lead generation with A/B testing feature of the tool. With GetResponse you get access to their more than 1000 stock images. Using these images and an online graphics tool such as Designhill, you can create great email layouts on your own. In case you do not wish to design the emails yourself, you can use any of the 500 email and newsletter templates offered by GetResponse. The tool offers a 30 days trial period with monthly, yearly or 2 yearly packages. The pricing plans start at £10 per month for the basic email plan and £1,199 per month for the Enterprise plan. Campaigner is a useful email marketing solution for small businesses. It offers great customization and segmentation possibilities. You can add filters to select certain users and create an audience based on your needs from the campaign. The tool offers A/B testing and CRM features. Google Analytics and Salesforce can be easily integrated with this tool as well. The user interface, as well as the newsletters, are mobile responsive. You can create your own reports using the multiple reporting options. The Campaigner offers 24/7 chat support for all its consumers and a 30 days trial period. Their package plans start at $19.95 and increase based on the number of subscribers. Emma is another powerful email marketing tool towards the expensive end but highly useful for small businesses. While some users have found certain features and functions laborious, some noted their interface to be intuitive. You can choose from their theme based sign up forms and emails from more than 100 premade templates. The tool offers A/B testing and custom software integration. One of the key features is that you can use segmentation for custom subject lines for your emails which can increase the open rates substantially. One of the major downsides is that their minimum package is for 2500 subscriber list, making it unfit for businesses without an accomplished mailing list. The pricing starts at $89 per month and goes up to $729 per month. Although there are trials at each level and their support team needs to be contacted to sign up. Constant contact is known for their useful features and competitive pricing. The tool is considered to be a robust email service experience but with a but with a complex interface and higher price point. The key features that constant contact offers include hundreds of responsive templates which are mobile responsive and can be customized. You can use the drag and drop email editing tool and schedule your emails on the go from the mobile app. Social media marketing tools can be integrated with the software. One of the major downsides for constant contacts is the poorly performing WordPress plug-in. The tool offers free live support for all users and a wide price range. The basic plan costs around $20 per month and can go up to $335 per month, based on the mailing list size. As you can see all the best tools have something great to offer you. No matter if you are a Graphic Design Services agency, a PR firm, or even an e-commerce business, there is an email marketing tool that fits into your set of requirements. Give it time, and always use the free trials offered by these software providers. This will give you a chance to take a test run and make an informed decision. Consider the critical questions such as customizations, analytics, interface, pricing, and automation to pick a tool for maximum ROI.